calling all fellow falsies! i mean, let's talk about this! how has it been? how are you holding up? good good good. we all have eyelids of steel now from all of this heavy lifting. when you take them off at night isn't it rather depressing at how common our naked eyelids look? i have now been wearing false lashes of one kind or another for an entire month and i am ready with some opinions to share. shall we take this terribly seriously despite our better judgment? first of all, i suspected this from the start and it turns out to be true: when it comes to strips, the faker it looks in the tray, the better it looks on your face. some weird backwards law of lashes i guess. my favorite so far has been the andrea brand in #33. they look crazy in the box but like glamour on the face. (if you're extremely fair they may be overkill) you can get four packs on amazon for $14 and they'll easily last you a month. here i am modeling the andrea #33. fancy! i've been using the glue that came in this starter kit. i've heard from a lot of you that maybe your glue isn't up to par. i suppose glue is an important part of this equation! i've been happy with the ardell glue, though it smells completely rancid at first. once it dries it's not so noticeable? i mean, the things we do for beauty, man. and then one day as i was browsing the lash aisle at the duane reade i decided to buy semi-permanent lash glue and this pack of individual lashes and just go for it. live life on the edge! i applied them while watching the downton abbey finale last week. (mr. bates (mista behhhts) totally did it.) i was entirely convinced i'd regret it immediately. but let me tell you. GAME CHANGER. i've had them on for a week now and i've only needed to do two touch ups, which took about five minutes each time. (i do sleep on my back, so your mileage my vary.) they even stood up to the nutso winds in manhattan last weekend, so i'm sold. sold i tell you! lash report over and out. AND HOW WAS THAT FOR A VERY SILLY POST? Not silly at all! Very important! Us short lashed ladies need to know how to properly fake it. I love wearing falsies! I typically only do them for special occassions, but you inspire me to try it on a regular basis. You look fab! It is so nice not to be the only one who must prounounce Bates's name like Anna. Obviously, there is no other way. Ahh! I've had a pack of lashes in my makeup drawer since Halloween that I'm itching to try, but can't bring myself to do it, for some reason. Oh, Mr. Bates. I don't want to believe he did it! So, I'm still saying she killed herself to frame him. thanks much for the lash report. just in time to go to the store to get more this weekend! They look smashing miss Holbrook! Question about your routine though, do you wear liner/mascara of any sort whilst wearing fake lashes? Or do they replace those products? what brand semi-permanent lash glue???? how about when washing the face or in the shower??? hahaha i love this, your lashes look great! i cannot for the life of me get them close enough to my lash line. i can however use the ones that just go on the outer edge. so, i guess i will settle for those for now...what i'm saying is, you've got mad eyelash skills! I don't think its silly at all. It makes me want to go and buy the most outrageous pair I can find. Oooh yes, I love the #33s! You might have inspired me to purchase them now!!!! This has been so much fun. Thanks for encouraging us to try it out. It is important to feel cute (even if it is just for your baby...)! There is no way Mr. Bates did it! I love him! I think Mr. Newspaper Man (can't remember his name) had something to do with it. They look good! I agree on the 33's! I found a smokin' deal on lash extensions, recently so I am trying those and I love them. No mascara, no glue, no fuss, just a bit of eyeliner. Financially I am not sure they make the most sense, but I will always have a back up. I discovered falsies at flight attendant camp, the veterans always looked so refreshed and chic. Once I found out about their secret, I was sold, I am a false fan for life! I would love to see what brand of semi-permanent glue you use. This makes me want to try them so bad! I'm not sure that my application would be the best, because let's face it, I don't exactly have a steady hand! BUT it's always worth a try. Plus for $14 on amazon, you can't really go wrong. thank you for this research! much appreciated. Yes- I am loving them...I have had eye lash extensions since last fall and now I have developed an allergy to the lash glue...and it's hard going back to normal lashes! I am so going to give these a whirl!! I have to say, it would really help save Downton Abbey (it's getting a bit formulaic, no?) if Bates is acquitted, then it turns out he really did it, and then he starts being a total awful jerk husband to Anna and THEN she is all "Oh wow, time to find my spine, where did I leave it? Oh, yeah, it's back in season 1." Your falsies look just BEAUTIFUL, you glam lady, you! Oooh they look so good. And thanks for the tip. 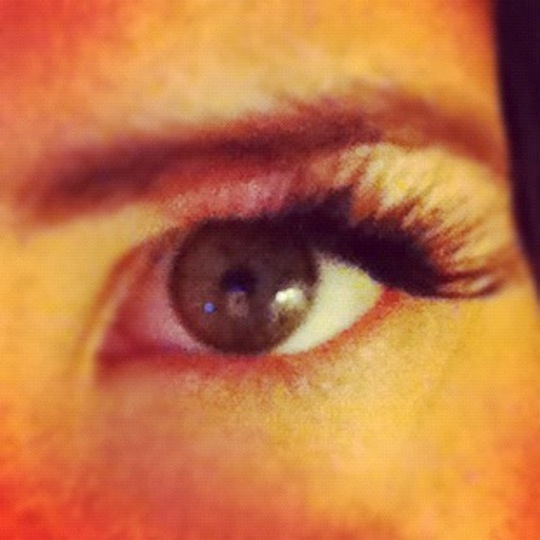 I am totally going to get #33 next time I buy lashes! Love the lash report! I need to try the 33's. Also, I gave the lashes another go-around, this time without any other eye makeup and it worked fabulously. Note to self: eyeliner + false lashes = FAIL. Downton Abbey is amazing. Just can't get enough. I want to live there. Oh how I wish I had the courage to try these babies for myself! I think the Mr. would love them but something about glue near my eye still skeeves me out. And while we're talkin' Downton, part of me totally think Mr. Bates could have done it. I mean he's just "too" nice of a guy don't you think? All suffering in silence over his injuries and evil ex-wife and everything? I would be worried for poor Anna but I think the show's producers are getting to be a bit too predictable for any unexpected plot twists to hit us in season 3. I couldn't get the links to work. I get "error 504" instead. IDK why i have problems getting your links but I really want to know the brand of lashes. I mean, I was like waiting for this post to come out I tell you! mr bates did not do it! you look gorgeous! i have blond hair and blond eyelashes/eyebrows so i feel like falsies would be a bit much. but the 33's look so freaking amazing on you that i'm thinking it's worth a shot. I am jealous of your lashes and your talent in applying them--I am useless probably because I have terrible eye sight or if I wear my contacts then worry I am going to get glue under my contact somehow and go blind. And I think my eyes aren't big enough--that is right I have tiny piggy holes that shouldn't be referred to as eyes. Love the lashes! I was having trouble with the "time and place" of false lashes, do for daily wear I have small ones I apply to the outside corner just to pump it up a little. Do you really think Mr. Bates did it??? I don't know how I feel about that. He just seems kind of saintly. But I guess it's the ones that we least suspect! Good for you! I am so terrible at applying them! Maybe I should try a youtube vid. Love this post. Please fix your links so I can start the falsies process too :) And your links in the tea party post are broken too...no bueno! Do you wash your face with the lashes in? I'm a false lash virgin and would love more details! His wife, the evil first one, not Anna, said to herself "To hell with it! If I can't be happy making him miserable in this life, I will kill myself and take him down in the process!" hilarious! Still trying to remember to do my smudgy eyeliner each morning- cuz it makes me feel pretty and bcs. falsies are way beyond me. Seriously, you have had the last ones on for a week. Do you wash your face and shower with them on? Amazing, I may try. Once, I tried to put on ELF lashes and was so frustrated...my eyes are deep set so I was convinced that was the reason but maybe they were too cheap. May rethink this...I do have a theory about lashes...check it out here! you're adorable. I actually prefer the ones you're wearing in the second pic on you, but whatever makes you feel pretty, wear! http://youtu.be/Q-WoF9jPHZo HAVE YOU SEEN THE DOWNTON ABBEY RAP? OMG. You wear them good! I hear they are an addictions.... it's hard to stop once you start wearing them! 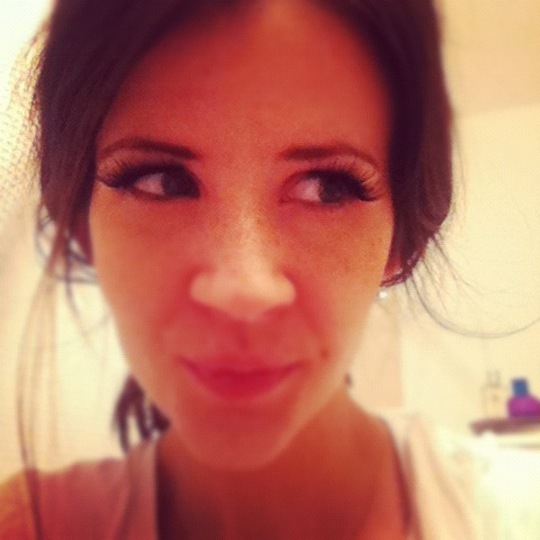 I agree the individual lashes are wonderful and they suit you more (going off the photos)! Fabulous solution compared to my stacking on of mascara. I'm actually tempted to go and get individual eyelash extensions done but my husband thinks I'm crazy for even considering it! He has very dark hair and dark eyelashes but I'm a natural blonde and my eyes just don't have the same definition! Keep on rocking those lashes lady! I cannot believe it's already been a month! I kept telling myself I needed to jump on Nat's falsies month but some how the time has escaped me. You look fabulous as always! good to know! I need to give it a go. Your links aren't working though? they look amazing! i have the most pathetic stubby lashes and by the end of the day it looks like i'm no longer wearing make up. i'm totally trying the falsies! ps. none of the links work!! Thank you so much for your fabulous insight on false lashes. I am always so intimidated to try them, but you give me hope!!! I was thisclose to buying some last week, maybe I'll have to give them a try. Nothing like looking glamorous for the kids! Ok, I also tried fake lashes recently. I tried the individual lashes first and didn't like them because they kind of hurt-you know when you squint. Do yours feel uncomfortable when you squint?? I liked the strips a lot better because I could take them off at night and they were much more comfortable, but I've only tried very natural looking ones, and they didn't quite have the "bam!" factor I was looking for. Now that I've read this post I think I will branch out to the less natural looking ones. AHH! I love this! I have been wanting to try false lashes FOREVER! But every time I buy them it turns out to be a real disaster. Perhaps I have just been purchasing the wrong kinds. Did it take you a while to master applying them? I just recently tried my first pair of fake lashes and I have to say....I quite loved the oomph that they added. This has inspired me to branch out and try more. Someday I shall be fashionable...at least I'm trying, right? Anyway, thanks for the report. 10-4. I, of course, couldn't help but partake in the false lash adventure. I, like you, am quite sold-my favorite has been the 33 as well! I think we should keep this going. Done and done. Love them! Quite liberating, no? I have to tell you this was the inspiration for doing my own eye lashes for my wedding. I honestly cannot tell you thank you enough!! Can you tell me the brand name/number of the lashes that you are wearing in the second photo? Thank you! !